If you liked this show, you should follow Michele Swinick. 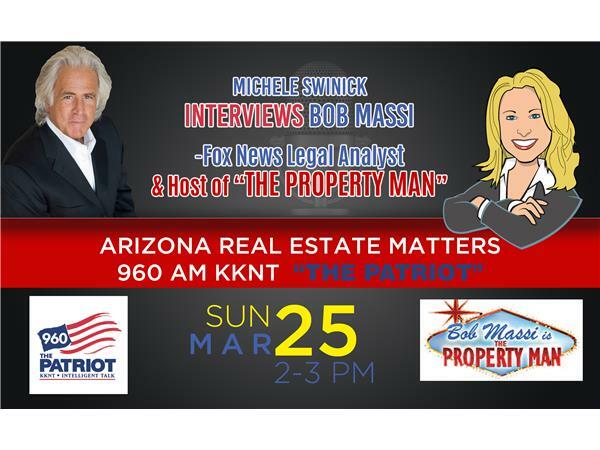 Bob & Michele make a SPECIAL APPEARANCE on 960am's "ARIZONA REAL ESTATE MATTERS". Bob is a practicing attorney, television personality, author, radio host & public speaker. He combines more than 30 years of courtroom experience with over 20 years as an on-camera legal analyst for Fox News where he also hosts his own show “The Property Man”. Bob is one of Helping The People's Expert Contributors. We’re a Real Estate Company, Home Resource Center and Non Profit that's disrupting the Home Buying & Selling Experience by providing Relationship-Based Real Estate with a Socially Conscious Purpose. If you’re looking to buy a home or it’s time to sell the one you’re in, our FREE service matches you with one of our Preferred Realtors, who are the All-Stars in their profession. They’re an invite only, exclusive group of the top 1% to 5% of Realtors in Arizona and the Greater San Diego Area–Truly the best of the best! We’ve personally worked with them & have a long-term relationship, so we know just how good they are. The really special quality of our Preferred Realtors is they want to give back to those who served for our country & change someone’s life, so they donate 25% of their commission to our "Homes For Veterans" program which financially supports Veterans who want to Buy a Home or need Home Improvements for their Service-Connected Injuries. You also have all of our services, marketing resources & expert contributors to additionally support you during your home process. Please give us a call at 833-694-6636 or visit www.helpingthepeople.org. We’d love the opportunity to have our Preferred Realtors included during your interview process & look forward to you becoming a part of our unique community.